SANTIAGO, Chile, June 6, 2011 (ENS) – A volcanic complex that has been quiet for decades erupted in southern Chile on Saturday, prompting the evacuation of some 3,500 area residents. Towering columns of smoke have been rising from the Puyehue-Cordon-Caulle mountain range, about 800 km (500 miles) south of the capital, Santiago. “The Cordon Caulle has entered an eruptive process, with an explosion resulting in a 10 kilometer (six mile) high gas column,” said Chilean Office of Emergency Management, ONEMI. Emergency officials have issued a red alert, the maximum warning level, for the area. No injuries have been reported. Undersecretary of the Interior Rodrigo Ubilla; the National Director of Chile’s national geological and mining agency, Enrique Valdivieso; and the Director of ONEMI, Vicente Nunez, said at a news conference Sunday that they hope to complete the evacuation before volcanic ash reaches the nearby towns. Ubilla that he will come himself to evacuate the population under the supervision of the Intendant of the Rivers and with the support of the Chilean Army and Customs officers, to prevent any emergency situation from arising. But some residents have refused to leave, for fear that their homes will be looted in their absence. Valdivieso said his agency is monitoring all the rivers near the Puyehue-Cordon-Caulle range to identify the level of acidity of the water and the amount of ashy material in suspension. Valdivieso said the wind is blowing the ashy plume towards neighboring Argentina. Airline Aerolineas Argentinas cancelled six flights on Saturday because of the volcano, the company said. 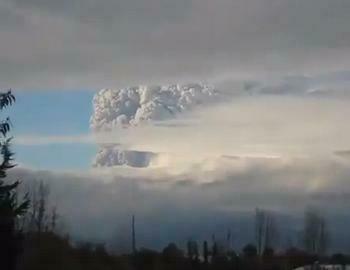 The ash cloud has blown over the Argentine ski resort city of San Carlos de Bariloche, closing the airport there. The eruption was preceded by earthquakes, which still continue to rock the region. The National Emergency Office has recorded an average of 230 minor quakes an hour. The eruption coincided with the visit of a delegation of three scientists from the U.S. Geological Survey to Santiago between May 30 and June 3 to share experiences and participate in an evaluation of technical issues with specialists from the University of Chile and ONEMI.